Wandering across Mexico’s high plains in the late 19th Century, Maria Trinidad Tellez Jirón hauled a trunk of books that had been passed down to her across the generations. The books were written in Hebrew. Though her name means “Mary Trinity,” Ma’Trini, as her descendants lovingly call her, was anything but a Catholic. Ma’Trini (ca. 1838-1938) and her ancestors were secret Jews—Marranos—and her descendants tell of their community being chased from Spain and hunted in Mexico long after the Inquisition’s official end—even into the early twentieth century. Ma’Trini was undeterred and taught Jewish customs to her children and grandchildren. Ma’Trini and her children founded the village of Venta Prieta, which began as a dusty roadside outpost in the State of Hidalgo, where the matriarch stopped her travels. In the early 20th century, Ma’Trini’s children built Venta Prieta’s first synagogue. Ma’Trini’s children and grandchildren continued expanding the community, inter-marrying with local families. Now the elders of a Jewish community with hundreds of adherents, many of Ma’Trini’s heirs are more observant than ever in their Jewish practice, living comfortably with non-Jewish neighbors amid brightly-painted shops and homes. Men from Venta Prieta gather daily as morning light filters through the stained-glass windows of the Negev synagogue. 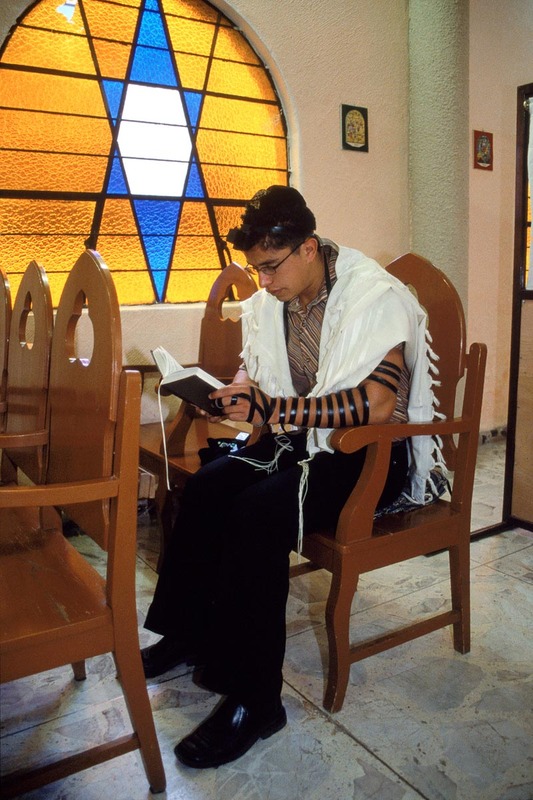 They pray the morning Shacharit service, each wearing a kippah, tefillin (phylacteries) and tallit (prayer shawl). Shalom, and welcome, to number 103, 16 de Septiembre street, named for September 16, 1810, a date celebrated like July 4, 1776 in the United States. Here, long-timecommunity leader Ruben Olvera Tellez lives in a comfortable, middle-class country house, or quinta, protected by a yellow stucco wall. The family of Jewish community president, Shimon Islas Olvera at their home in Venta Prieta, Hidalgo, Mexico.